Colours are maroon or dark red, the material can be suede, micro-suede hunting calf, moleskin or similar. 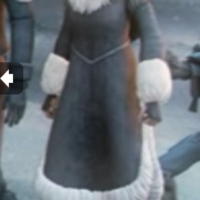 Dress is visible at neckline of the coat. – Necklace / choker: a thin golden ring with a golden diamond. – Six (6) small and one (1) large triangular, pewter pieces of jewellery on the head framing the face. – Pewter ceremonial chain on the montrals. (See reference pictures). The coat is a warm toned grey in color. The fabric of the coat should have a texture similar to suede, or micro-suede. The coat must have a center front seam running all the way down the center of the coat but must not have a center back seam. The Belt and armband details should be the same material as the coat but in a lighter grey color, they should have dimension that matches references to make them ‘puff out’ from the body of the coat. Fur of the coat should be white, fur should have texture either with styling or additional tufts fur should not hang flat. Fur should continue to be the same width on the underside of the coat hem matching references. At the bottom of the coat in the front the fur should have a break in it. The fur should follow the side seams of the coat. The fur should curve at the corners of the coat from the bottom to the side it should not be a sharp corner. The body of the coat and the sleeves should have a pattern that matches the references in a lighter grey similar to the color of the armbands and belt. The pattern is not present on the hood of the coat, the pattern can be painted, silk screened, or printed onto the coat, the pattern should match references. Hood should be made to properly fit the headpiece, hood should have a fur edging and a defined break at the front of the hood matching references. The hood should have a white tuft on each top point of the hood and aligns with the tips of the montrals of the headpiece. There should not be any visible center seams coming down the back of the hood. The back of the hood should come to a point that ends at the bottom of the belt, the coat should have a fur tuft in white that comes out of the bottom of the hood.